That John preached and did so effectively is confirmed by Josephus, but what did he preach about? Luke and Matthew suggest that the message was an apocalyptic one, familiar even to this day: repent your sins, for the day of judgement is coming. Of course, the Christian message is that John was prophesying the imminent arrival of Christ: 'he that cometh after me is mightier than I, whose shoes I am not worthy to bear'. However, some scholars suggest that the gospel references to this were included by the Gospel writers to reinforce their message and are not necessarily authentic. There is little doubt, however, that in view of the tinder-box political situation at the time, such oratory would alarm the authorities. Luke tells us that publicans (tax-gatherers) and soldiers sought advice from John, and his responses could certainly be seen as subversive. Likewise his description of Pharisees and Sadducees as vipers (Matthew) would not have gone down well with the religious elite. 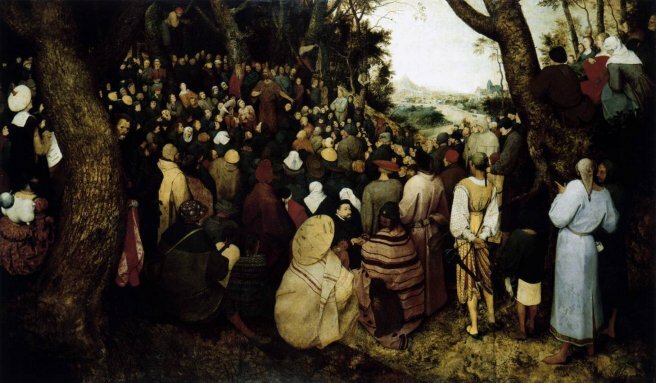 Sadly, much of the art showing the preaching of John does not do his powers of oratory justice; there is more concern with landscape and figure painting. The crowd in Allori's painting seem quite engaged, although the bearded figure in the centre looks as if he is about to nod off. Bacchiacca's version looks more like a fashion show. Images of John baptising Christ are very familiar in art, though few artists have tackled images of him baptising others. 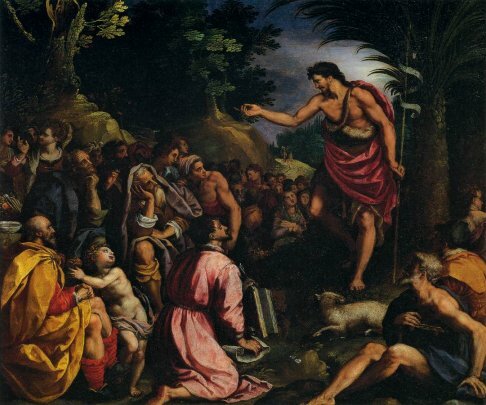 Below is one by Poussin, though it is probably not very accurate. Tradition suggests that the rite involved total immersion. 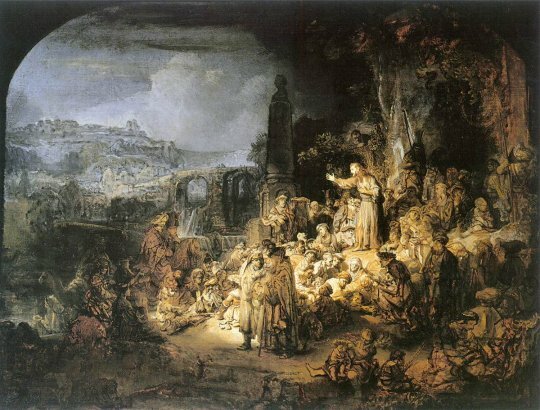 What has engaged theologians and biblical historians is the origin of the baptism ritual, which was not a tradition in Judaism. Ritual washing was, however, and could be repeated when required. 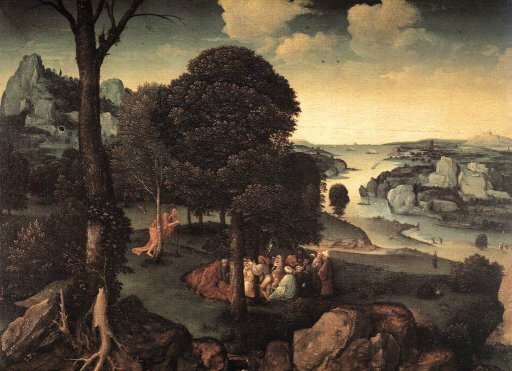 For John, and in later Christianity, it was a sacrament that happened just once. Was it an invention of John, or was there an unrecorded tradition, perhaps with pagan origins? A fascinating discovery in recent years poses more questions than answers. 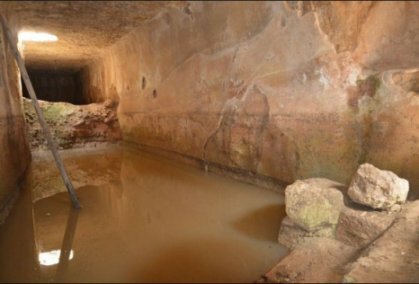 What has become known as the cave of John the Baptist is located outside Jerusalem, very close to the village of Ein Karem, the reputed birthplace of John. For an account of excavations there read The Cave of John the Baptist by Shimon Gibson - an engrossing read. There are strong indications that ritual baptism took place here, and there is a rough wall painting featuring what is said to be John the Baptist. What is significant is that while some of the pottery fragments found there date from the time of John, but others appear to date from long before his time. 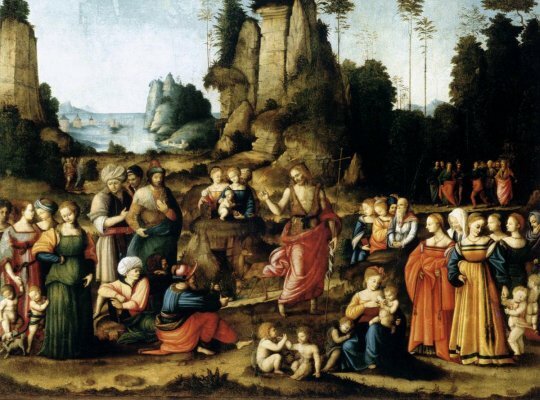 Does this suggest that a previously unknown sect existed, for whom baptism was important? And did John ever come here? 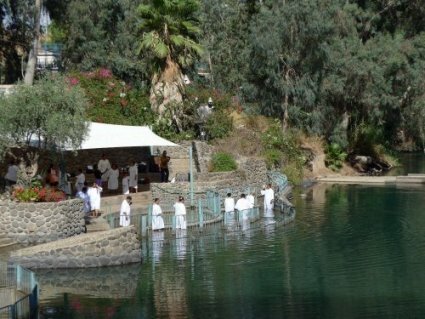 Baptism still takes place in the River Jordan, as we saw on our visit in 2015. The photograph shows it happening at Yardenit, just south of the Sea of Galilee. This is not, however, the reputed site for John's baptismal rites. This is further south, around nine miles north of the Dead Sea. Sadly, this site is now polluted and the water flow is intermittent. 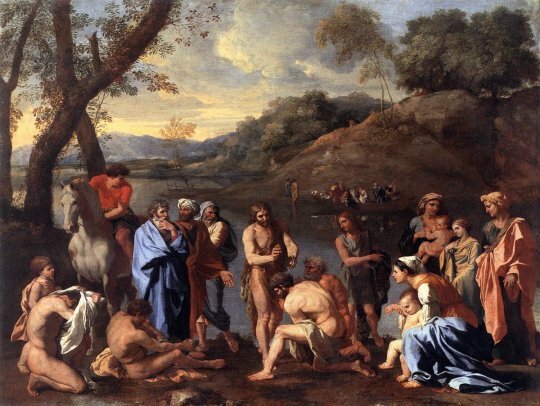 Nicolas Poussin: Baptising the People. Louvre, Paris. Yardenit, on the River Jordan.